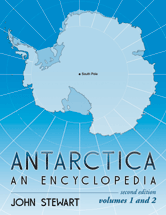 This second edition of the 1990 Library Journal "Best Reference" book, four years in the compiling and writing, is an exhaustive A-Z direct-entry encyclopedia of Antarctica. It doubles the first editions entries to 30,000, covering geographical features, historical events, explorers, expeditions, airplanes, ships, scientists, scientific stations, tour operators, scientific terms, birds, animals, insects, flora, items of general interest and much more. "Antarctica" is defined as all land and water south of 60Â°S.